Chemical warfare (CW) involves using the toxic properties of chemical substances as weapons. This type of warfare is distinct from nuclear warfare and biological warfare, which together make up NBC, the military acronym for nuclear, biological, and chemical (warfare or weapons), all of which are considered "weapons of mass destruction" (WMDs). None of these fall under the term conventional weapons which are primarily effective due to their destructive potential. In theory, with proper protective equipment, training, and decontamination measures, the primary effects of chemical weapons can be overcome. In practice, they continue to cause much suffering, as most victims are defenceless civilians. Many nations possess vast stockpiles of weaponized agents in preparation for wartime use. The threat and the perceived threat have become strategic tools in planning both measures and counter-measures. The use of chemical weapons is prohibited under customary international humanitarian law. Schedule 3 – Have legitimate large-scale industrial uses. Examples include phosgene and chloropicrin. Both have been used as chemical weapons but phosgene is an important precursor in the manufacture of plastics and chloropicrin is used as a fumigant. The OPCW must be notified of, and may inspect, any plant producing more than 30 tons per year. Arsenical smokes were known to the Chinese as far back as c. 1000 BC and Sun Tzu's "Art of War" (c. 200 BC) advises the use of fire weapons. In the second century BC, writings of the Mohist sect in China describe the use of bellows to pump smoke from burning balls of toxic plants and vegetables into tunnels being dug by a besieging army. Other Chinese writings dating around the same period contain hundreds of recipes for the production of poisonous or irritating smokes for use in war along with numerous accounts of their use. These accounts describe an arsenic-containing "soul-hunting fog", and the use of finely divided lime dispersed into the air to suppress a peasant revolt in 178 AD. The earliest archaeological evidence of gas warfare is during the Roman–Persian wars. Research carried out on the collapsed tunnels at Dura-Europos in Syria suggests that during the siege of the town in the third century AD, the Sassanians used bitumen and sulfur crystals to get it burning. When ignited, the materials gave off dense clouds of choking sulfur dioxide gases which killed 19 Roman soldiers and a single Sassanian, purported to be the fire-tender, in a matter of two minutes. Quicklime (the old name for calcium oxide) may have been used in medieval naval warfare - up to the use of "lime-mortars" to throw it at the enemy ships. Historian and philosopher David Hume, in his history of England, recounts how in the reign of Henry III (r.1216 - 1272) the English Navy destroyed an invading French fleet, by blinding the enemy fleet with quicklime. D’Albiney employed a stratagem against them, which is said to have contributed to the victory: Having gained the wind of the French, he came down upon them with violence; and gassing a great quantity of quicklime, which he purposely carried on board, he so blinded them, that they were disabled from defending themselves. Christoph Bernhard von Galen tried to use toxic fumes during the siege of the city of Groningen in 1672. 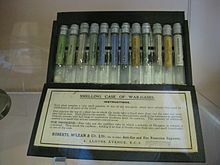 The Hague Declaration of 1899 and the Hague Convention of 1907 forbade the use of "poison or poisoned weapons" in warfare, yet more than 124,000 tons of gas were produced by the end of World War I. The French were the first to use chemical weapons during the First World War, using the tear gases ethyl bromoacetate and chloroacetone. They likely did not realize that effects might be more serious under wartime conditions than in riot control. It is also likely that their use of tear gas escalated to the use of poisonous gases. One of Germany's earliest uses of chemical weapons occurred on October 27, 1914, when shells containing the irritant dianisidine chlorosulfonate were fired at British troops near Neuve-Chapelle, France. Germany used another irritant, xylyl bromide, in artillery shells that were fired in January 1915 at the Russians near Bolimów, in present-day Poland. The first full-scale deployment of deadly chemical warfare agents during World War I was at the Second Battle of Ypres, on April 22, 1915, when the Germans attacked French, Canadian and Algerian troops with chlorine gas. World War I-era chemical ammunition is still found, unexploded, at former battle, storage, or test sites and poses an ongoing threat to inhabitants of Belgium, France and other countries. Camp American University where American chemical weapons were developed and later buried, has undergone 20 years of remediation efforts. After the war, the most common method of disposal of chemical weapons was to dump them into the nearest large body of water. As many as 65,000 tons of chemical warfare agents may have been dumped in the Baltic Sea alone; agents dumped in that sea included mustard gas, phosgene, lewisite (β-chlorovinyldichloroarsine), adamsite (diphenylaminechloroarsine), Clark I (diphenylchloroarsine) and Clark II (diphenylcyanoarsine). Over time the containers corrode, and the chemicals leaked out. On the sea floor, at low temperatures, mustard gas tends to form lumps within a "skin" of chemical byproducts. These lumps can wash onto shore, where they look like chunks of waxy yellowish clay. They are extremely toxic, but the effects may not be immediately apparent. 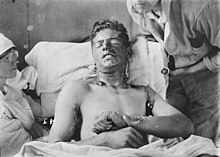 Between World War I and World War II, chemical agents were occasionally used to subdue populations and suppress rebellion. Lenin's Soviet government employed poison gas in 1921 during the Tambov Rebellion. An order signed by military commanders Tukhachevsky and Vladimir Antonov-Ovseyenko stipulated: "The forests where the bandits are hiding are to be cleared by the use of poison gas. This must be carefully calculated, so that the layer of gas penetrates the forests and kills everyone hiding there." In violation of the Geneva Protocol, Italy used mustard gas and other "gruesome measures" against Senussi forces in Libya (see Pacification of Libya, Italian colonization of Libya). Poison gas was used against the Libyans as early as January 1928  The Italians dropped mustard gas from the air. 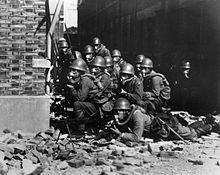 Beginning in October 1935 and continuing into the following months Fascist Italy used mustard gas against the Ethiopians during the Second Italo-Abyssinian War in violation of the Geneva Protocol. Italian general Rodolfo Graziani first ordered the use of chemical weapons at Gorrahei against the forces of Ras Nasibu. Benito Mussolini personally authorized Graziani to use chemical weapons. Chemical weapons dropped by warplane "proved to be very effective" and was used "on a massive scale against civilians and troops, as well as to contaminate fields and water supplies." Among the most intense chemical bombardment by the Italian Air Force in Ethiopia occurred in February and March 1936, although "gas warfare continued, with varying intensity, until March 1939." J. F. C. Fuller, who was present in Ethiopia during the conflict, stated that mustard gas "was the decisive tactical factor in the war." Some estimate that up to one-third of Ethiopian casualties of the war were caused by chemical weapons. The Italians' deployment of mustard gas prompted international criticism. In April 1936, British Prime Minister Stanley Baldwin told Parliament: "If a great European nation, in spite of having given its signature to the Geneva Protocol against the use of such gases, employs them in Africa, what guarantee have we that they may not be used in Europe?" Mussolini initially denied the use of chemical weapons; later, Mussolini and Italian government sought to justify their use as lawful retaliation for Ethiopian atrocities. After the liberation of Ethiopia in 1941, Ethiopia repeatedly but unsuccessfully sought to prosecute Italian war criminals. The Allied powers excluded Ethiopia from the United Nations War Crimes Commission (established 1942) because the British feared that Ethiopia would seek to prosecute Pietro Badoglio, who had ordered the use of chemical gas in the Second Italo-Abyssinian War, but later "became a valuable ally against the Axis powers" after the fascist regime of Mussolini fell and Italy switched sides to join the Allied powers. In 1946, the Ethiopians under Haile Selassie again sought "to prosecute senior Italian officials who had sanctioned the use of chemical weapons and had omitted other war crimes such as torturing and executing Ethiopian prisoners and citizens during the Italian-Ethiopian War." These attempts failed, in large part because Britain and the U.S. wished to avoid alienating the Italian government at a time when Italy was seen as key to containing the Soviet Union. Following World War II, the Italian government denied that Italy had ever used chemical weapons in Africa; only in 1995 did Italy formally acknowledge that it had used chemical weapons in colonial wars. The Germans eventually used poison gas on survivors from the Battle of Kerch, May 1942. During the Holocaust, a genocide perpetrated by Nazi Germany, millions of Jews and other victims were gassed with carbon monoxide and hydrogen cyanide (including Zyklon B). This remains the deadliest use of poison gas in history. Nevertheless, the Nazis did not extensively use chemical weapons in combat, at least not against the Western Allies, despite maintaining an active chemical weapons program in which the Nazis used concentration camp prisoners as forced labor to secretly manufacture tabun, a nerve gas, and experimented upon concentration camp victims to test the effects of the gas. Otto Ambros of IG Farben was a chief chemical-weapons expert for the Nazis. The Nazis' decision to avoid the use of chemical weapons on the battlefield has been variously attributed to a lack of technical ability in the German chemical weapons program and fears that the Allies would retaliate with their own chemical weapons. It also has been speculated to have arisen from the personal experiences of Adolf Hitler as a soldier in the Kaiser's army during World War I, where he was gassed by British troops in 1918. After the Battle of Stalingrad, Joseph Goebbels, Robert Ley, and Martin Bormann urged Hitler to approve the use of tabun and other chemical weapons to slow the Soviet advance. At a May 1943 meeting in the Wolf's Lair, however, Hitler was told by Ambros that Germany had 45,000 tons of chemical gas stockpiled, but that the Allies likely had far more. Hitler responded by suddenly leaving the room and ordering production of tabun and sarin to be doubled, but "fearing some rogue officer would use them and spark Allied retaliation, he ordered that no chemical weapons be transported to the Russian front." After the Allied invasion of Italy, the Germans rapidly moved to remove or destroy both German and Italian chemical-weapon stockpiles, "for the same reason that Hitler had ordered them pulled from the Russian front—they feared that local commanders would use them and trigger Allied chemical retaliation." Stanley P. Lovell, Deputy Director for Research and Development of the Office of Strategic Services, reports in his book Of Spies and Stratagems that the Allies knew the Germans had quantities of Gas Blau available for use in the defense of the Atlantic Wall. The use of nerve gas on the Normandy beachhead would have seriously impeded the Allies and possibly caused the invasion to fail altogether. He submitted the question "Why was nerve gas not used in Normandy?" to be asked of Hermann Göring during his interrogation after the war had ended. Göring answered that the reason was that the Wehrmacht was dependent upon horse-drawn transport to move supplies to their combat units, and had never been able to devise a gas mask horses could tolerate; the versions they developed would not pass enough pure air to allow the horses to pull a cart. Thus, gas was of no use to the German Army under most conditions. The Nazis did use chemical weapons in combat on several occasions along the Black Sea, notably in Sevastopol, where they used toxic smoke to force Russian resistance fighters out of caverns below the city, in violation of the 1925 Geneva Protocol. The Nazis also used asphyxiating gas in the catacombs of Odessa in November 1941, following their capture of the city, and in late May 1942 during the Battle of the Kerch Peninsula in eastern Crimea. Victor Israelyan, a Soviet ambassador, reported that the latter incident was perpetrated by the Wehrmacht's Chemical Forces and organized by a special detail of SS troops with the help of a field engineer battalion. Chemical Forces General Ochsner reported to German command in June 1942 that a chemical unit had taken part in the battle. After the battle in mid-May 1942, roughly 3,000 Red Army soldiers and Soviet civilians not evacuated by sea were besieged in a series of caves and tunnels in the nearby Adzhimushkay quarry. After holding out for approximately three months, "poison gas was released into the tunnels, killing all but a few score of the Soviet defenders." Thousands of those killed around Adzhimushkay were documented to have been killed by asphyxiation from gas. In February 1943, German troops stationed in Kuban received a telegram: "Russians should be eventually cleared out of the mountain range with gas." The troops also received two wagons of toxin antidotes. The British stockpiled chemical weapons to use in case of a German invasion. Pictured is a chemical warfare bulk decontamination vehicle. The mustard gas stockpile was enlarged in 1942–1943 for possible use by RAF Bomber Command against German cities, and in 1944 for possible retaliatory use if German forces used chemical weapons against the D-Day landings. In 1945, the U.S. Army's Chemical Warfare Service standardized improved chemical warfare rockets intended for the new M9 and M9A1 'Bazooka' launchers, adopting the M26 Gas Rocket, a cyanogen chloride (CK)-filled warhead for the 2.36-in rocket launcher. CK, a deadly blood agent, was capable of penetrating the protective filter barriers in some gas masks, and was seen as an effective agent against Japanese forces (particularly those hiding in caves or bunkers), whose gas masks lacked the impregnants that would provide protection against the chemical reaction of CK. While stockpiled in US inventory, the CK rocket was never deployed or issued to combat personnel. In the late 1940s and early 1950s, British postwar chemical weapons research was based at the Porton Down facility. Research was aimed at providing Britain with the means to arm itself with a modern nerve-agent-based capability and to develop specific means of defense against these agents. In the early 1950s, nerve agents such as sarin were produced— about 20 tons were made from 1954 until 1956. CDE Nancekuke was an important factory for stockpiling chemical weapons. Small amounts of VX were produced there, mainly for laboratory test purposes, but also to validate plant designs and optimise chemical processes for potential mass production. However, full-scale mass production of VX agent never took place, with the 1956 decision to end the UK's offensive chemical weapons programme. In the late 1950s, the chemical weapons production plant at Nancekuke was mothballed, but was maintained through the 1960s and 1970s in a state whereby production of chemical weapons could easily re-commence if required. There were reports of chemical weapons being used during the Soviet–Afghan War, sometimes against civilians. According to Mirzayanov, the Soviets also developed weapons that were safer to handle, leading to the development of binary weapons, in which precursors for the nerve agents are mixed in a munition to produce the agent just prior to its use. Because the precursors are generally significantly less hazardous than the agents themselves, this technique makes handling and transporting the munitions a great deal simpler. Evidence points to a top-secret Rhodesian program in the 1970s to use organophosphate pesticides and heavy metal rodenticides to contaminate clothing as well as food and beverages. The contaminated items were covertly introduced into insurgent supply chains. Hundreds of insurgent deaths were reported, although the actual death toll likely rose over 1,000. According to the Foreign Policy, the "Iraqis used mustard gas and sarin prior to four major offensives in early 1988 that relied on U.S. satellite imagery, maps, and other intelligence. ... According to recently declassified CIA documents and interviews with former intelligence officials like Francona, the U.S. had firm evidence of Iraqi chemical attacks beginning in 1983." In March 1988, the Iraqi Kurdish town of Halabja was exposed to multiple chemical agents dropped from warplanes; these "may have included mustard gas, the nerve agents sarin, tabun and VX and possibly cyanide." Between 3,200 and 5,000 people were killed, and between 7,000 and 10,000 were injured. Some reports indicated that three-quarters of them were women and children. The preponderance of the evidence indicates that Iraq was responsible for the attack. The U.S. Department of Defense and Central Intelligence Agency's longstanding official position is that Iraqi forces under Saddam Hussein did not use chemical weapons during the Persian Gulf War in 1991. In a memorandum in 1994 to veterans of the war, Defense Secretary William J. Perry and General John M. Shalikashvili, the chairman of the Joint Chiefs of Staff, wrote that "There is no evidence, classified or unclassified, that indicates that chemical or biological weapons were used in the Persian Gulf." Other sources of evidence for sporadic Iraqi chemical warfare include U.S. intelligence reports on the presence of Iraqi chemical weapons in the KTO; military log entries describing the discovery by U.S. units of chemical munitions in Iraqi bunkers during and after the ground war; incidents in which troops reported acute symptoms of toxic chemical exposure; and credible detections of chemical-warfare agents by Czech, French, and American forces. Nerve agents (specifically, tabun, sarin, and cyclosarin) and blister agents (specifically, sulfur-mustard and lewisite) were detected at Iraqi sites. The threat itself of gas warfare had a major effect on Israel, which was not part of the coalition forces led by the US. Israel was attacked with 39 scud missiles, most of which were knocked down in the air above their targets by Patriot missiles developed by Raytheon together with Israel, and supplied by the US. Sirens warned of the attacks approximately 10 minutes before their expected arrival, and Israelis donned gas masks and entered sealed "safe" rooms, over a period 5 weeks. Babies were issued special gas-safe cribs, and religious men were issued gas masks that allowed them to preserve their beards. In 2014, tapes from Saddam Hussain's archives revealed that Saddam had given orders to use gas against Israel as a last resort if his military communications with the army were cut off. In 2015 The New York Times published an article about the declassified report of operation Avarice in 2005 in which over 400 chemical weapons including many rockets and missiles from the Iran-Iraq war period were recovered and subsequently destroyed by the CIA. Many other stockpiles, estimated by UNSCOM up to 600 metric tons of chemical weapons, were known to have existed and even admitted by Saddam's regime, but claimed by them to have been destroyed. These have never been found but are believed to still exist. The UN first accused Cuba of deploying chemical weapons against Angolan civilians and partisans in 1988. Wouter Basson later disclosed that South African military intelligence had long verified the use of unidentified chemical weapons on Angolan soil; this was to provide the impetus for their own biological warfare programme, Project Coast. During the Battle of Cuito Cuanavale, South African troops then fighting in Angola were issued with gas masks and ordered to rehearse chemical weapons drills. Although the status of its own chemical weapons program remained uncertain, South Africa also deceptively bombarded Cuban and Angolan units with colored smoke in an attempt to induce hysteria or mass panic. According to Defence Minister Magnus Malan, this would force the Cubans to share the inconvenience of having to take preventative measures such as donning NBC suits, which would cut combat effectiveness in half. The tactic was effective: beginning in early 1988 Cuban units posted to Angola were issued with full protective gear in anticipation of a South African chemical strike. On October 29, 1988, personnel attached to Angola's 59 Brigade, accompanied by six Soviet military advisors, reported being struck with chemical weapons on the banks of the Mianei River. The attack occurred shortly after one in the afternoon. Four Angolan soldiers lost consciousness while the others complained of violent headaches and nausea. That November the Angolan representative to the UN accused South Africa of employing poison gas near Cuito Cuanavale for the first time. Sarin, mustard agent and chlorine gas have been used during the conflict. Numerous casualties led to an international reaction, especially the 2013 Ghouta attacks. A UN fact-finding mission was requested to investigate alleged chemical weapons attacks. In four cases the UN inspectors confirmed use of sarin gas. In August 2016, a confidential report by the United Nations and the OPCW explicitly blamed the Syrian military of Bashar al-Assad for dropping chemical weapons (chlorine bombs) on the towns of Talmenes in April 2014 and Sarmin in March 2015 and ISIS for using sulfur mustard on the town of Marea in August 2015. In 2016, Jaysh al-Islam rebel group had used chlorine gas or other agents against Kurdish militia and civilians in the Sheikh Maqsood neighborhood of Aleppo. Many countries, including the United States and the European Union have accused the Syrian government of conducting several chemical attacks. Following the 2013 Ghouta attacks and international pressure, Syria acceded to the Chemical Weapons Convention and the destruction of Syria's chemical weapons began. In 2015 the UN mission disclosed previously undeclared traces of sarin compounds[disputed – discuss] in a "military research site". After the April 2017 Khan Shaykhun chemical attack, the United States launched its first attack against Syrian government forces. On 14 April 2018, the United States, France and the United Kingdom carried out a series of joint military strikes against multiple government sites in Syria, including the Barzah scientific research centre, after a chemical attack in Douma. In July 1974, a group calling themselves the Aliens of America successfully firebombed the houses of a judge, two police commissioners, and one of the commissioner's cars, burned down two apartment buildings, and bombed the Pan Am Terminal at Los Angeles International Airport, killing three people and injuring eight. The organization, which turned out to be a single resident alien named Muharem Kurbegovic, claimed to have developed and possessed a supply of sarin, as well as four unique nerve agents named AA1, AA2, AA3, and AA4S. Although no agents were found at the time Kurbegovic was arrested in August 1974, he had reportedly acquired "all but one" of the ingredients required to produce a nerve agent. A search of his apartment turned up a variety of materials, including precursors for phosgene and a drum containing 25 pounds of sodium cyanide. On December 29, 1999, four days after Russian forces began an assault of Grozny, Chechen terrorists exploded two chlorine tanks in the town. Because of the wind conditions, no Russian soldiers were injured. In an anti-terrorist attack on October 26, 2002, Russian special forces used a chemical agent (presumably KOLOKOL-1, an aerosolized fentanyl derivative), as a precursor to an assault on Chechen terrorists, which ended the Moscow theater hostage crisis. All 42 of the terrorists and 120 out of 850 hostages were killed during the raid. Although the use of the chemical agent was justified as a means of selectively targeting terrorists, it killed over 100 hostages. It has been suggested that this article be merged into Chemical weapon. (Discuss) Proposed since August 2018. 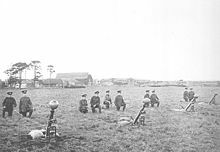 Shells were tested successfully at the Wahn artillery range near Cologne on January 9, 1915, and an order was placed for 15 cm howitzer shells, designated ‘T-shells’ after Tappen. A shortage of shells limited the first use against the Russians at Bolimów on January 31, 1915; the liquid failed to vaporize in the cold weather, and again the experiment went unnoticed by the Allies. There may need to be immediate intervention to prevent death, such as injection of atropine for nerve agents. Decontamination is especially important for people contaminated with persistent agents; many of the fatalities after the explosion of a WWII US ammunition ship carrying mustard gas, in the harbor of Bari, Italy, after a German bombing on December 2, 1943, came when rescue workers, not knowing of the contamination, bundled cold, wet seamen in tight-fitting blankets. For example, in 1854 Lyon Playfair (later 1st Baron Playfair, GCB, PC, FRS (May 1, 1818 – May 29, 1898), a British chemist, proposed using a cacodyl cyanide-filled artillery shell against enemy ships during the Crimean War. The British Ordnance Department rejected the proposal as "as bad a mode of warfare as poisoning the wells of the enemy." In June 1997, India declared that it had a stockpile of 1044 tons of sulphur mustard in its possession. India's declaration of its stockpile came after its entry into the Chemical Weapons Convention, that created the Organisation for the Prohibition of Chemical Weapons, and on January 14, 1993 India became one of the original signatories to the Chemical Weapons Convention. By 2005, from among six nations that had declared their possession of chemical weapons, India was the only country to meet its deadline for chemical weapons destruction and for inspection of its facilities by the Organisation for the Prohibition of Chemical Weapons. By 2006, India had destroyed more than 75 percent of its chemical weapons and material stockpile and was granted an extension to complete a 100 percent destruction of its stocks by April 2009. On May 14, 2009 India informed the United Nations that it has completely destroyed its stockpile of chemical weapons. Russia signed into the Chemical Weapons Convention on January 13, 1993 and ratified it on November 5, 1995. Declaring an arsenal of 39,967 tons of chemical weapons in 1997, by far the largest arsenal, consisting of blister agents: Lewisite, Sulfur mustard, Lewisite-mustard mix, and nerve agents: Sarin, Soman, and VX. Russia met its treaty obligations by destroying 1 percent of its chemical agents by the 2002 deadline set out by the Chemical Weapons Convention, but requested an extension on the deadlines of 2004 and 2007 due to technical, financial, and environmental challenges of chemical disposal. Since, Russia has received help from other countries such as Canada which donated C$100,000, plus a further C$100,000 already donated, to the Russian Chemical Weapons Destruction Program. This money will be used to complete work at Shchuch'ye and support the construction of a chemical weapons destruction facility at Kizner (Russia), where the destruction of nearly 5,700 tons of nerve agent, stored in approximately 2 million artillery shells and munitions, will be undertaken. Canadian funds are also being used for the operation of a Green Cross Public Outreach Office, to keep the civilian population informed on the progress made in chemical weapons destruction activities. As of July 2011, Russia has destroyed 48 percent (18,241 tons) of its stockpile at destruction facilities located in Gorny (Saratov Oblast) and Kambarka (Udmurt Republic) - where operations have finished - and Schuch'ye (Kurgan Oblast), Maradykovsky (Kirov Oblast), Leonidovka (Penza Oblast) whilst installations are under construction in Pochep (Bryansk Oblast) and Kizner (Udmurt Republic). As August 2013, 76 percent (30,500 tons) were destroyed, and Russia leaves the Cooperative Threat Reduction (CTR) Program, which partially funded chemical weapons destruction. 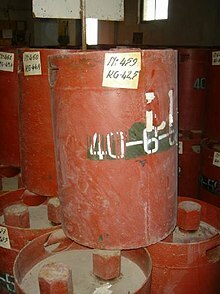 The U.S. began stockpile reductions in the 1980s with the removal of outdated munitions and destroying its entire stock of 3-Quinuclidinyl benzilate (BZ or Agent 15) at the beginning of 1988. In June 1990 the Johnston Atoll Chemical Agent Disposal System began destruction of chemical agents stored on the Johnston Atoll in the Pacific, seven years before the Chemical Weapons Treaty came into effect. In 1986 President Ronald Reagan made an agreement with the Chancellor, Helmut Kohl to remove the U.S. stockpile of chemical weapons from Germany. In 1990, as part of Operation Steel Box, two ships were loaded with over 100,000 shells containing Sarin and VX were taken from the U.S. Army weapons storage depots such as Miesau and then-classified FSTS (Forward Storage / Transportation Sites) and transported from Bremerhaven, Germany to Johnston Atoll in the Pacific, a 46-day nonstop journey. Although herbicidal warfare use chemical substances, its main purpose is to disrupt agricultural food production and/or to destroy plants which provide cover or concealment to the enemy. 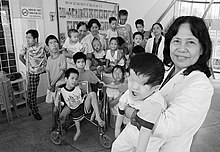 The use of herbicides as a chemical weapon by the U.S. military during the Vietnam War has left tangible, long-term impacts upon the Vietnamese people that live in Vietnam. For instance, it led to 3 million Vietnamese people suffering health problems, one million birth defects caused directly by exposure to Agent Orange, and 24% of the area of Vietnam being defoliated. ^ "Convention on the Prohibition of the Development, Production, Stockpiling and Use of Chemical Weapons and on Their Destruction (CWC): Annexes and Original Signatories". Bureau of Arms Control, Verification and Compliance. Retrieved January 19, 2012. ^ Stephanie Pappas, “Buried Soldiers May Be Victims of Ancient Chemical Weapon,” LiveScience, March 8, 2011, http://www.livescience.com/13113-ancient-chemical-warfare-romans-persians.html (accessed October 3, 2014). ^ Sayers W. The Use of Quicklime in Medieval Naval Warfare // The Mariner's Mirror. - Volume 92 (2006). - Issue 3. - PP. 262-269. ^ David Hume, History of England, Volume II. ^ Eric Croddy (2002). Chemical and Biological Warfare: A Comprehensive Survey for the Concerned Citizen. Springer. p. 131. ISBN 9780387950761. ^ Smart, Jeffery K. "CHEMICAL AND BIOLOGICAL WARFARE RESEARCH AND DEVELOPMENT DURING THE CIVIL WAR" (PDF). United States Army. US Army Soldier and Biological Chemical Command. Retrieved November 7, 2014. ^ Verwey, Wil D. (1977). Riot control agents and herbicides in war : their humanitarian, toxicological, ecological, military, palemological, and legal aspects. Lieden: Sigthoff. pp. 33–34, 196. ISBN 9789028603363. Retrieved April 13, 2017. ^ Faith, Thomas (2014). Behind the gas mask : the U.S. chemical warfare service in war and peace. Champaign, IL: University of Illinois Press. p. 9. ISBN 978-0252080265. Retrieved April 14, 2017. ^ "April 22, 1915: Germans introduce poison gas". This Day In History. Retrieved April 14, 2017. ^ Colditz, Graham A. (2007). Encyclopedia of cancer and society. Los Angeles: Sage Publications. pp. 1013–1015. ISBN 978-1412949897. Retrieved April 14, 2017. ^ Albright, Richard D. (2012). Cleanup of chemical and explosive munitions : locating, identifying contaminants, and planning for environmental remediation of land and sea military ranges and ordnance dumpsites (2nd ed.). Amsterdam: Elsevier/William Andrew. pp. 137–240. ISBN 978-1-4377-3477-5. Retrieved April 13, 2017. ^ Ashooh, Emma (December 7, 2015). "A Hidden History: American University's Role in World War I". American Word. Retrieved April 13, 2017. ^ a b Curry, Andrew (November 10, 2016). "Weapons of War Litter the Ocean Floor". Hakai Magazine. Retrieved April 14, 2017. ^ Tyner, James A. (2010). Military legacies : a world made by war. New York (N.Y.): Routledge. pp. 113–115. ISBN 978-0415995948. Retrieved April 14, 2017. ^ Andrulewicz, E. (2007). "Chemical weapons dumped in the Baltic Sea". In Gonenc, I.E. ; Koutitonsky, V.G. ; Rashleigh, B.; Ambrose, R.B. ; Wolflin, J.P. (eds.). Assessment of the Fate and Effects of Toxic Agents on Water Resources. NATO Security through Science Series (NATO Security through Science Series ed.). Dordrecht: Springer. pp. 299–319. doi:10.1007/978-1-4020-5528-7_15. ISBN 978-1-4020-5526-3. ^ HELCOM (1994). Report on Chemical Munitions Dumped in the Baltic Sea Report to the 16th Meeting of Helsinki Commission 8 - 11 March 1994 from the Ad Hoc Working Group on Dumped Chemical Munition (HELCOM CHEMU) January 1994 (PDF). Danish Environmental Protection Agency. ^ Edvard Radzinsky (2011). Stalin. Knopf Doubleday. p. 173. ISBN 9780307754684. ^ a b Ronald Bruce St John, Libya: Continuity and Change (Routledge, 2015), p. 16. ^ Saskia van Genugten, Libya in Western Foreign Policies, 1911–2011 (Palgrave Macmillan, 2016), p. 31. ^ Andrew Jackson Waskey & Spencer C. Tucker, "Senussi and Sultan of Darfur Rebellions" in Encyclopedia of Insurgency and Counterinsurgency: A New Era of Modern Warfare (ed. Spencer C. Tucker: ABC-CLIO, 2013), p. 498. ^ a b c d e f "Chemical Weapons" in Historical Dictionary of Ethiopia, 2d ed. (eds. David H. Shinn & Thomas P. Ofcansky: Scarecrow Press, 2013). ^ a b c Rainer Baudendistel, Between Bombs and Good Intentions: The International Committee of the Red Cross and the Italo-Ethiopian War, 1935-1936, pp. 264-67. ^ William R. Cullen, Is Arsenic an Aphrodisiac? : The Sociochemistry of an Element (Royal Society of Chemistry, 2008), p. 241. ^ a b c d Jeffrey Legro, Cooperation Under Fire: Anglo-German Restraint During World War II (Cornell University Press, 2005). ^ Walter Laqueur, The New Terrorism: Fanaticism and the Arms of Mass Destruction (Oxford University Press, 1999), p. 57. ^ Edward M. Spiers, Chemical and Biological Weapons: A Study of Proliferation (Macmillan: 1994). ^ "Introduction" in Italian Colonialism (eds. Ruth Ben-Ghiat & Mia Fuller: Palgrave Macmillan, 2005), p. 6. ^ Corum, James S., The Roots of Blitzkrieg, University Press of Kansas, USA, 1992, pp.106-107. ^ "Laws of War: Declaration on the Use of Projectiles the Object of Which is the Diffusion of Asphyxiating or Deleterious Gases; July 29, 1899". Avalon.law.yale.edu. Retrieved January 18, 2014. ^ "Convention (IV) respecting the Laws and Customs of War on Land and its annex: Regulations concerning the Laws and Customs of War on Land. The Hague, 18 October 1907". International Committee of the Red Cross. Retrieved January 18, 2014. ^ a b c d e f g Patrick Coffey, American Arsenal: A Century of Weapon Technology and Strategy (Oxford University Press, 2014), p. 152-54. ^ a b James J. Wirtz, "Weapons of Mass Destruction" in Contemporary Security Studies (4th ed. ), ed. Alan Collins, Contemporary Security Studies (Oxford University Press, 2016), p. 302. ^ a b Callum Borchers, Sean Spicer takes his questionable claims to a new level in Hitler-Assad comparison, The Washington Post (April 11, 2017). ^ Germany and the Second World War, Vol. 5, Issue 2 (Clarendon Press, 2003), p. 764. ^ "Century of biological and chemical weapons". BBC News. September 25, 2001. ^ Stanley P. Lovell, Of Spies & Strategems (Englewood Cliffs, New Jersey: Prentice-Hall, 1963), p. 78. ^ a b Chris Bellamy, Absolute War: Soviet Russia in the Second World War (Knopf, 2008). ^ a b Israelyan, Victor (November 1, 2010). On the Battlefields of the Cold War: A Soviet Ambassador's Confession. p. 339. ISBN 978-0271047737. ^ Merridale, Catherine, Ivan's War, Faber & Faber: pp. 148-150. ^ a b Гречко, p. 468. ^ a b Bellamy, Christopher (June 4, 1996). "Sixty secret mustard gas sites uncovered". The Independent. ^ "Chemical Warfare -Suffolk". Anti-Invasion defences Suffolk World War II. Retrieved June 18, 2008. ^ a b Pears, Brian. "Chapter 5 Invasion". Rowlands Gill and the North-East 1939 - 1945. Archived from the original on August 6, 2006. ^ Alanbrooke, 2001. Entry July 22, 1940. ^ BBC2 Newsnight, 1/5/81; The Guardian, 7,9,13,20,30/5, 2/6/81; The Times, 11/5/81, 20/5/81, 15/6/81; The Listener, 25/6, 2/7, 17/8/81; Daily Telegraph, 18,21,25,29/5, 2,11/6/81; Encounter magazine, Vol.58-9 no.2; New Society, Vol.60; Bulletin of the Atomic Scientists, Vol.4 no.4 and 'Churchill's Anthrax Bombs - a debate', Vol.4 no.12, November 1987. ^ "Paxman and Harris", p132-35. ^ a b c Smart, Jeffrey (1997), "2", History of Chemical and Biological Warfare: An American Perspective, Aberdeen, MD, USA: Army Chemical and Biological Defense Command, p. 32 . ^ "Characteristics and Employment of Ground Chemical Munitions", Field Manual 3-5, Washington, DC: War Department, 1946, pp. 108–19 . ^ Ghosh, R.; Newman, J.E. (January 29, 1955). "A new group of organophosphorus pesticides". Chemistry and Industry: 118. ^ G B Carter. Porton Down: a brief history. ^ G B Carter (2000). Chemical and Biological Defence at Porton Down 1916–2000. The Stationery Office. ^ Robert Bud; Philip Gummett (2002). Cold War, Hot Science: Applied Research in Britain's Defence Laboratories, 1945-1990. Science museum. ISBN 9781900747479. ^ a b "Nancekuke Remediation Project". Ministry of Defence (Archived by The National Archives). Archived from the original on December 8, 2010. Retrieved April 25, 2012. ^ "KPNLF says Vietnamese Using Suffocant Gas," Bangkok World, January 4, 1985, p. 1. ^ "Viets Accused of Using Gas Against Rebels," Associated Press, February 19, 1985. ^ "Thais Report a Clash with Vietnamese Troops," Associated Press, February 20, 1985. ^ "Exclusive: CIA Files Prove America Helped Saddam as He Gassed Iran". Foreign Policy. August 26, 2013. 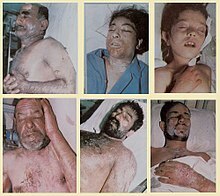 ^ "Chemical attacks on Iran: When the US looked the other way". Al-Jazeera. April 19, 2018. ^ a b c d On this day: 1988: Thousands die in Halabja gas attack, BBC News (March 16, 1988). ^ a b c d Jonathan B. Tucker, Evidence Iraq Used Chemical Weapons During the 1991 Persian Gulf War, The Nonproliferation Review (Spring-Summer 1997), pp. 114-22. ^ Chivers, C.J. ; Schmitt, Eric (February 15, 2015). "CIA is said to have bought and destroyed Iraqi chemical weapons". The New York Times. Retrieved May 21, 2016. ^ a b c Hawk, Kathleen Dupes; Villella, Ron; Varona, Adolfo Leyva de (July 30, 2014). Florida and the Mariel Boatlift of 1980: The First Twenty Days. University of Alabama Press. ISBN 978-0817318376. Retrieved October 11, 2014. ^ "Chemical weapons being used in Angola?". Park City Daily News. Bowling Green, Kentucky. August 22, 1986. Retrieved July 28, 2015. ^ "Cubans using poison gas in Angola". The Lewiston Journal. Lewiston–Auburn, Maine. August 26, 1988. Retrieved July 28, 2015. ^ a b Tokarev, Andrei; Shubin, Gennady, eds. (2011). Bush War: The Road to Cuito Cuanavale: Soviet Soldiers' Accounts of the Angolan War. Auckland Park: Jacana Media (Pty) Ltd. pp. 128–130. ISBN 978-1-4314-0185-7. ^ Falkland Islanders at war, Bound, Graham, Pen and Sword Books Limited, ISBN 1-84415-429-7. ^ "CDC | Facts About Sarin". www.bt.cdc.gov. Retrieved October 7, 2015. ^ Syria Used Chlorine in Bombs Against Civilians, Report Says, The New York Times, Rick Gladstone, August 24, 2016 retrieved August 25, 2016. ^ "Kurdish Officials: Rebels May Have Used Chemicals in Aleppo". Voice of America. April 8, 2016. ^ Louisa Loveluck (May 9, 2015). "UN inspectors find undeclared sarin-linked chemicals at Syrian military site". London: The Telegraph. Retrieved May 9, 2015. ^ "Text of the Biological and Toxin Weapons Convention". Brad.ac.uk. Retrieved September 5, 2013. ^ "UNTC". Treaties.un.org. Retrieved September 16, 2011. ^ Gray, Colin. (2007). Another Bloody Century: Future Warfare. Page 269. Phoenix. ISBN 0-304-36734-6. ^ a b "STATUS OF PARTICIPATION IN THE CHEMICAL WEAPONS CONVENTION AS AT 14 OCTOBER 2013". Organisation for the Prohibition of Chemical Weapons. OPCW. October 14, 2013. ^ a b "SIGNATORY STATES". Organisation for the Prohibition of Chemical Weapons. OPCW. September 2, 2013. ^ "Myanmar Joins Chemical Weapons Convention". OPCW. July 9, 2015. ^ In Surprise Testimony Cheney Renews Opposition to CWC (PDF), United States Senate, April 8, 1997, archived from the original (PDF) on December 17, 2008, retrieved January 4, 2009. ^ "India declares its stock of chemical weapons". Archived from the original on November 6, 2012. Retrieved February 26, 2016. ^ "India to destroy chemical weapons stockpile by 2009". DominicanToday.com. Archived from the original on September 7, 2013. Retrieved September 16, 2011. ^ "India destroys its chemical weapons stockpile". Indo-Asian News Service. May 14, 2009. ^ "Iraq Joins the Chemical Weapons Convention". Opcw.org. Retrieved September 16, 2011. ^ "Abandoned Chemical Weapons (ACW) in China". Nti.org. Archived from the original on August 29, 2011. Retrieved September 16, 2011. ^ "Ceremony Marks Start of Destruction of Chemical Weapons Abandoned by Japan in China". Opcw.org. Retrieved September 16, 2011. ^ "Canada Contributes to Russia's Chemical Weapons Destruction Programme". Opcw.org. Archived from the original on April 26, 2012. Retrieved September 16, 2011. ^ "Research Library: Country Profiles: China Chemical". NTI. Archived from the original on June 5, 2011. Retrieved September 16, 2011. ^ "Russia destroys over 76 percent of its chemical weapons stockpile". ^ Guarino, Douglas P. "New U.S.-Russian Security Deal Greatly Scales Back Scope, Experts Say | Global Security Newswire". NTI. Retrieved September 5, 2013. ^ "Rocky Mountain Arsenal | Region 8 | US EPA". Epa.gov. Retrieved September 16, 2011. ^ The Oceans and Environmental Security: Shared U.S. and Russian Perspectives. ^ "Not with Impunity: Assessing US Policy for Retaliating to a Chemical or Biological Attack". Airpower.maxwell.af.mil. Retrieved September 16, 2011. ^ "The legacy of Agent Orange". BBC News. April 29, 2005. ^ Gustafson, Mai L. (1978). War and Shadows: The Haunting of Vietnam. Ithaca and London: Cornell University Press. p. 125. This page was last edited on 15 April 2019, at 23:10 (UTC).